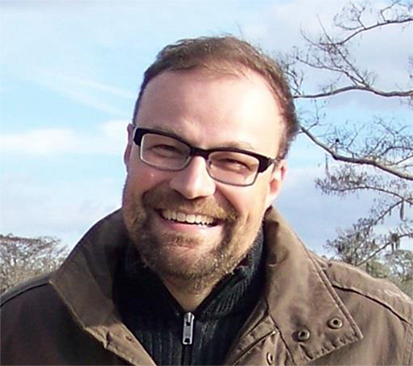 I am a neuroscientist who is interested in how the human brain and body adapt to good and bad things that happen to us, and how we learn from them. I am particularly fascinated with how different people see the world differently, depending on their life history. My colleagues and I hope to use some of that knowledge to help those who suffer from problems with their mental well-being. 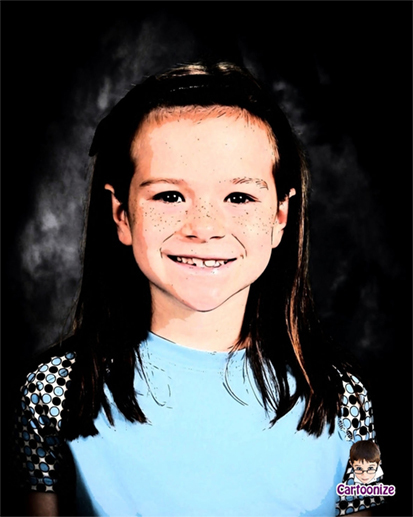 My name is Allie and I am 9 years old. I live in central Illinois. My favorite subjects in school are maths, reading, and science. Outside of school, I like gymnastics and basketball. Wait. What? Often, we miss something that we wanted to see, hear, or feel—especially when there is a lot of information competing for our attention. We mostly notice this problem when we try to make the brain process lots of information at high speed. Imagine for instance that you are playing a video game and browsing the internet while checking text messages on your phone. Here, we look at how neuroscientists (scientists who study the brain and behavior) answer questions about information that comes at us very quickly: What draws our attention? How does paying attention to one thing affect how we see other things? How long does it take to notice and remember something important? Neuroscientists have found that the brain uses a trick to pay attention to one thing in a rapid stream, but it comes at a cost. Also, what we want to pay attention to is often not what we end up noticing, despite our best efforts. How Do Media Challenge the Brain’s Abilities? We use media to learn about the world and stay in touch with other people. Media are all the devices and things that give this information to us, such as the internet, movies, the radio, and so on. Our tablets, cell phones, and computers help us use these media and they get faster every year. We like to use this digital speed to experience more things at once, and at a faster pace. In fact, we get annoyed when the screen freezes and nothing moves. Scientists have measured the amount of data that enter the brain and found that an average person living today processes as much as 74 GB in information a day (that is as much as watching 16 movies), through TV, computers, cell phones, tablets, billboards, and many other gadgets. Every year it is about 5% more than the previous year . Only 500 years ago, 74 GB of information would be what a highly educated person consumed in a lifetime, through books and stories. How do human brains deal with this challenge? Research in many areas of neuroscience (the study of the brain and behavior) has shown that our brains are built to learn and adjust to a changing world. As our ancestors developed bigger brains and started behaving more like the humans we are today, their brain areas responsible for seeing, hearing, or feeling the world took up an increasingly important role. These brain areas learn from experience and get better at noticing events that are really important or meaningful to us, such as threats (a growling dog, for example) and opportunities (delicious food, for example). 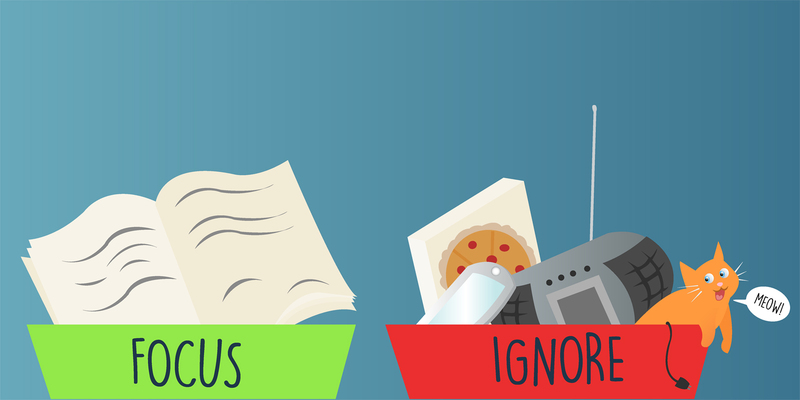 Having our senses focus on things that matter and ignore unimportant things helps us to have the best possible behaviors, remember important information, and learn from mistakes as well as successes . One smart trick the human brain has for noticing important events is to pick out a few things that we see or hear and to hold on to those things and examine them more closely to make sense of them. This prevents us from being overwhelmed by all the many things we see, hear, or feel. For example, even when typing in a quiet office, there are birds chirping outside, cars driving by the window, e-mail notifications on the computer, and many other things that we would better ignore if we wish to get our work done. Selective attention is the term that researchers use for the process of paying attention to only a few of the things that we notice with our senses. Having smart phones and tablets available all the time challenges the brain’s selective attention in completely new ways. These technologies create an environment in which we constantly switch attention on and off rapidly, between important and unimportant things. Imagine working on your after-school homework, for example “Find out what foods penguins eat by searching the Web.” This is the thing you have to focus on, so at the present time it is important to you. In order to get your search done smoothly, it is helpful not to attend to other (for the homework unimportant) things, such as ads popping up on the website you are studying, or the text message on your phone. We call the things that interfere with what we want to pay attention to distractors. They distract us from a task we want to do (or something we need to do). However, some events do not distract us much (for example, wind blowing in the trees), whereas other events do (someone saying our name in the next room), even though the events are equally noticeable. Why is this? What Does the Brain Like to Pay Attention To? For a long time, neuroscience researchers thought of “attention” as something that is best understood when a person does a task, such as trying to read while listening to music. 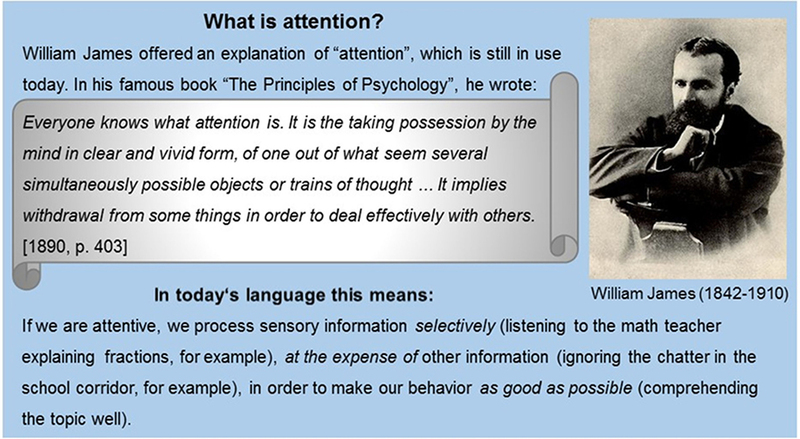 As shown in Box 1, William James, who wrote the first book on modern psychology (the study of behavior and experience) , described attention this way: We focus on one thing while ignoring other things. In fact, we still use his definition to study attention today. In the neuroscience laboratory, people complete tasks that resemble very basic computer games: different shapes, letters, words, or dots appear on a computer screen. People are then asked to press a button as fast as possible, but only when they notice a particular object; for example, they are told, “Only press the button if a red triangle appears on the left side of the screen.” Researchers have found that our brains focus on one particular object by using several areas of the brain working together. These areas then give a boost to the parts of the brain whose job it is to see or hear the important, or “attended,” thing. William James (pictured on the right) lived in the 1800s and is considered the “Father of American Psychology.” He is known as one of the first modern scientists who studied things that go on in our minds, such as attention and emotion. What James found out about attention is still the foundation of what researchers study in the laboratory today. In the real world, we do not often pay attention to colored dots or shapes, like we use for attention studies in the lab. We focus on things that are important to what we want to do. Researchers have found that the things we pay attention to tend to be either pleasant or unpleasant, good or bad. For example, nobody needs to point out that the person we are talking to is giving us a huge smile, or to tell us to pay attention to a rattlesnake that comes right at us. We have learned over our lifetimes that good and bad things tend to be important, and we better notice them or we will miss out on something nice (or will be in trouble). Neuroscientists have found out that if something is very good or very bad, then the brain regions that help us know what is good or bad team up with the brain regions that help us pay attention. Together, these brain areas make sure we do not overlook the really important stuff (the snake or the smiling person) . So far, this sounds great, but it turns out that it takes time for these different parts of the brain to team up and focus on important things: If we cross the street at a busy intersection, when we are distracted by something, the distraction may take our attention away from the street for enough time to allow a car to run us over! Thus, our brain needs to balance our attention toward interesting and appealing events (our friend on the other side of the street) with the attention toward a task (safely crossing the street). We can think of attention like a bank account, where spending on one thing leaves a little less in the account for spending on other things. 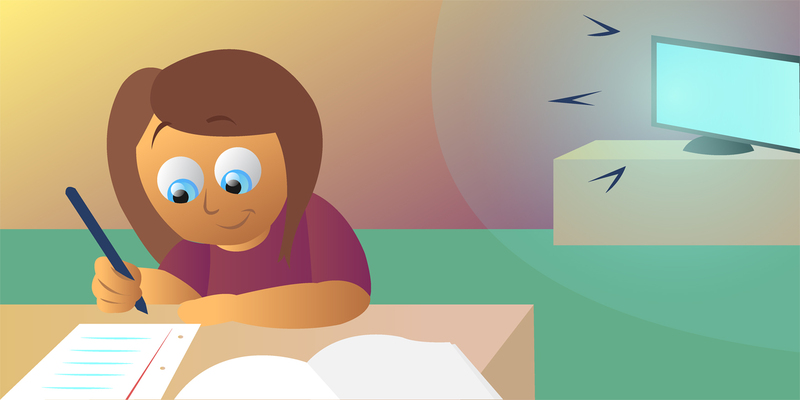 Our own research has shown that there are students who can balance their personal attention account well, saving some attention for later. These students often do better in school subjects, such as reading and spelling . We will see next how people can balance their attention accounts in the best possible way, when multiple things compete for their attention. How Long Does Distraction Last? People working as flight controllers, customs officers, or video game programmers often face challenges where they must pick out one important thing while a lot of unimportant things happen rapidly before and after the important event (for example, an airplane touching down). Researchers call the things that people are asked to pick out in these tasks a target. In the real world, targets and distracting objects do not typically appear at the same time, but often follow each other. This is especially true for videos, games, and web sites. One important question is: Are we worse at picking out a target after seeing a powerful, interesting distractor, such as a picture of delicious food, smiling people, our favorite sports team or actor? We can study this by showing participants pictures that are different in emotional content, some of them interesting, and some of them boring, and then right afterward ask them to do a task. In Figure 1, we show you one way researchers have done this. Participants were told that they would see a series of pictures that flashed briefly and that they could ignore these pictures (after a few milliseconds), their actual task was presented: a letter string appeared on the screen and participants were asked to press one key when the letter string made up a real word, and another key if the letters made up a fake word. Without a picture flashing in front of them, people were pretty good at this task and completed it in around half a second. But, we found that after seeing a really interesting picture that had nothing to do with the task, people did more poorly: they took longer to decide whether the letter string was a real or fake word, even though the distracting picture was no longer there . Adults took half a second longer and 11–13-year olds took a full second longer when they saw an interesting picture first, compared with when they saw a boring picture. This means that the brain has difficulty letting go of something that has caught our attention. It would be nice to be able to turn attention on and off rapidly, so that we find it easier to see the next important piece, and the next, and so on. Is this possible? A. An experiment in which the task people were asked to do (reading real and fake words) was preceded by distractor pictures. These pictures caused different emotions in people, such as pleasure, disgust, or just a boring feeling. In this example, the distractor picture contains something pleasant (ice cream in a crunchy cone), which makes the picture interesting for many people (at least for ice cream lovers). After a brief time (200 or 600 ms), either an actual word (“introduce”) or a fake word (“icludoce”) appeared as the target on the computer screen. Children between 11 and 13 years old were invited to figure out, as quickly and as accurately as possible, whether the word was real or fake. They had to press the left (green) mouse button when they thought it was a real word and they had to press the right (red) mouse button when they thought it was not a real word. Part B. of the figure shows how fast the kids responded to the targets, that is, how long it took them to figure out whether it was a real or a fake word. This time is indicated by the size of the blocks: the higher the block, the slower the response. You can see that the kids took more time to figure out what type of target appeared when they first saw an interesting distractor picture (like ice cream) instead of a boring picture (like a potted cactus). What if We Need to Flip Attention on and Off? In many textbooks for school or in computer software for learning, you can find cartoons or entertaining/happy pictures next to equations, tables, or complex figures. This is because the authors think that it would be more enjoyable to work with the book or software if it contains fun stuff as well as the subject matter. But, as we just saw, seeing fun and interesting pictures next to the learning material may distract us. Distraction may be a problem, especially when we have to look at the material quickly. Sometimes, we would love to be able to focus on something important that we just saw and think about it (a target), ignore something we already know (a distractor), then pick out something interesting again (another target), and ignore what comes after (another distractor), and so on. It turns out that this rapid flipping on and off of attention is particularly difficult for the brain. A good example of the problems that arise from rapid switching between targets and distractors is the so-called attentional blink effect. The attentional blink effect happens when we are asked to see important things that occur every once in a while in the middle of a rapid stream of other, unimportant things . This situation is shown in Figure 2. Imagine you are asked to find out what the kids in some of the pictures eat. In this task, you first see all sorts of different food items, several of them in each second. But none of the pictures have kids in them, so you can ignore them. Then, a boy who eats bread is shown. Yay! First target! Next up is a picture of toast in a toaster—not what you are looking for! The brain tries to ignore it, even though it looks yummy. While you are still busy ignoring the crispy toast, there is the second target (a girl eating watermelon)! It turns out that most people do not notice the second target! After they have seen the whole sequence of pictures, they are unable to report seeing that there were two kids eating something. Researchers have used many different versions of the task shown in Figure 2A. They have found that our ability to rapidly switch back and forth between important and unimportant things is at its worst when there is one distractor sandwiched in time between two targets. This is shown in Figure 2B. However, participants have less difficulty noticing the second target when we give themselves enough time between the targets, by presenting more than just one unimportant picture between the two targets. 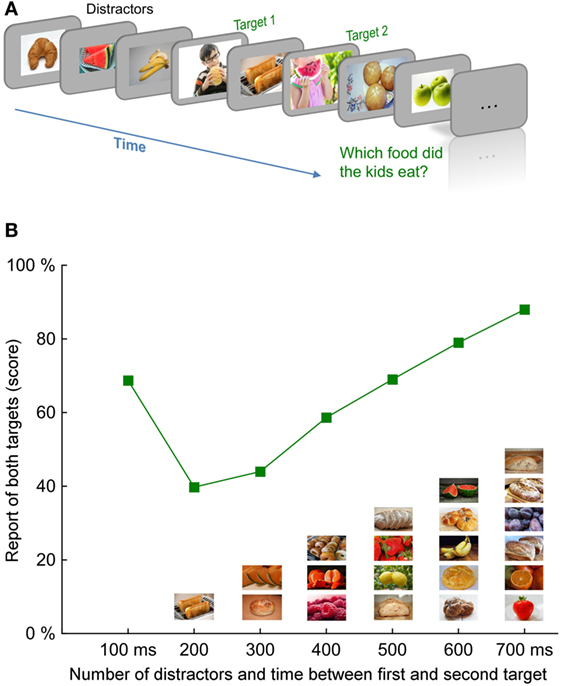 Another piece of good news: If we string together the targets (two pictures of kids eating something, in our example), participants can report them well. From these studies, researchers have learned that paying attention to rapid streams of many important things in a row is surprisingly easy for the brain. It becomes difficult, however, when we have to go rapidly back and forth between attending and ignoring things. Using a device that monitors the electric brain waves when participants performed this task, researchers figured out a possible reason for this problem. As we said above, attention may work like a bank account that needs time to fill up when the money is gone . If you withdraw all of your attention to focus on the first target and to ignore the next unimportant thing, the attention account cannot be filled fast enough and you miss out on the second target. 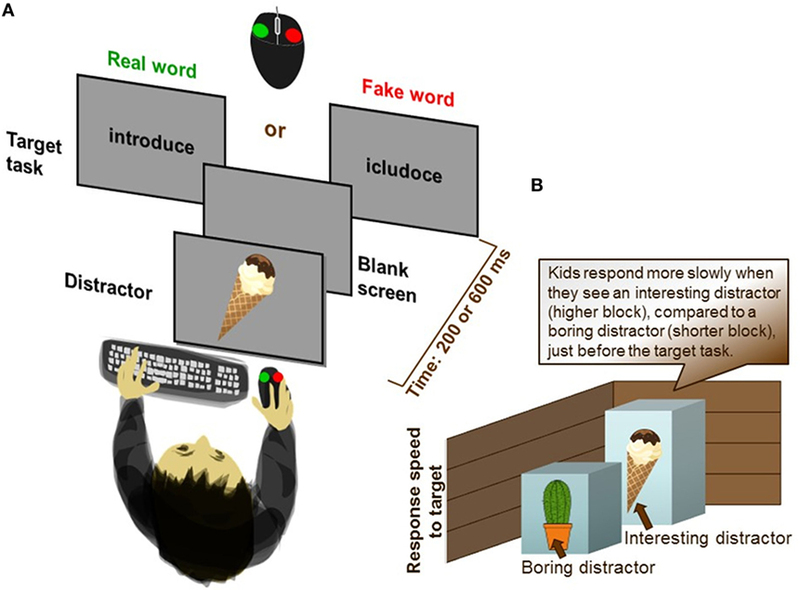 Figure 2 - This figure shows the way researchers study how our attention switches on and off rapidly. In the example shown in A. a person views a very rapid stream of pictures that are flying by so quickly that is hard to keep track. Then the task is to report something special that happens in two of the pictures (the targets). In particular, people were asked to pay attention to what the kids in the pictures were eating. The content of the other pictures in the sequence (different kind of fruits/berries and bread/pastries) was not important and could be ignored. These pictures are thus called distractors. In B. you can see how well participants did in seeing both target pictures (those with kids eating something). The Y axis describes the score [percent (%)] participants got doing the task, meaning how often they reported both targets. The X axis describes two events: 1. how much time passed between the occurrence of the first and second target in the rapid stream (from 100 up to 700 ms), and 2. how many distractor pictures were presented between the two targets (between zero and six distractors). You can see that participants had a hard time noticing both targets, especially when the first target (attend!) was followed by one distractor picture (ignore! ), and then immediately followed by the second target (attend again! quickly!). It turns out that this rapid switching between important and unimportant things is too difficult for most people. By contrast, if we showed enough unimportant pictures between the two targets, people very often reported both targets, meaning, they got a high score. Usually, participants also yielded a good score when the two target pictures followed each other immediately, without a sandwiched distractor picture. In this paper, we have seen that paying attention depends a lot on how fast things change around us. Trying as hard as we can also does not necessarily help with paying attention: People who have learned to relax while working on fast-paced tasks tend to be better at them, and also tend to be better at many other skills, such as spelling, reading, or memory tasks. In the future, researchers will look more closely into how people keep up with all the interesting things that are often hidden in the buzz and noise of our world, things hit us through electronic devices that seem to become a bit smaller and faster every year. 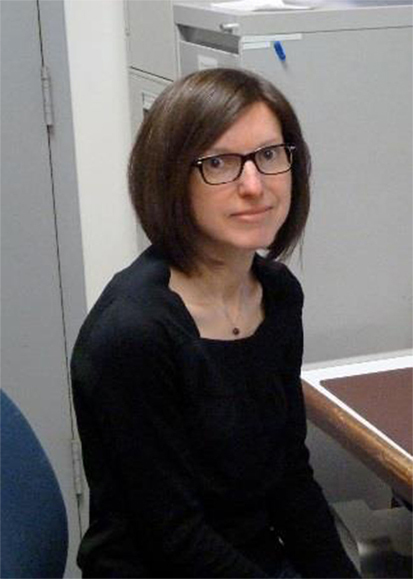 Selective attention: ↑ For neuroscientists, paying attention has two parts: (1) picking out important things from the flow of information that constantly enters our senses (for example, sight, hearing, touch) and (2) protecting these important things from being overwritten by less important pieces of information. Interfere: ↑ When a thing prevents or distracts you from doing an important task. For example, you would like to focus on your reading work, but the sudden text alert from your smart phone is distracting you. Distractor: ↑ Picture yourself again focusing on your reading work and suddenly your smart phone is ringing or your tummy is rumbling. If your focus (or attention) is now shifting to the phone or the hungry feeling, then that thing is distracting you from continuing your important reading. This thing works as a troublemaker or distractor. Target: ↑ The important thing you have to attend to and work on. For example, you have to focus on your reading or math work. Millisecond: ↑ A millisecond (abbreviated ms) is one-thousandth of a second. Attentional blink effect: ↑ The attentional blink effect happens when we try to find two things, for example, in a rapid stream of pictures, or in a video. When the two things happen quickly after each other, but with something distracting appearing in between the two, then the brain often misses the second of the two things we wanted to find. ↑ Bohn, R., and Short, J. 2012. Measuring consumer information. Int. J. Comm. 6:980–1000. ↑ Lang, P. J., Bradley, M. M., and Cuthbert, B. N. 1997. Motivated attention: affect, activation, and action. In: Lang, P. J., Simons, R. F., and Balaban, M. T., editors. Attention and Orienting: Sensory and Motivational Processes. Hillsdale, NJ: Erlbaum. p. 97–135. ↑ James, W. 1890. Principles of Psychology. New York, NY: Holt. Submitted: January 27, 2017; Accepted: May 11, 2017; Published online: June 1, 2017.